Telephone: +1 800 672 6124. With knowledge local staff dispensing advice on what to do, where to stay and where to eat, the New Orleans Metropolitan Convention & Visitors Bureau should be your first stop. There is also a Welcome Centre in the French Quarter on Jackson Square, 529 St Ann Street (tel: +1 504 568 5661), open daily 0830-1700. The New Orleans Power Pass (www.visiticket.com) allows free admission to many of the city's attractions. You can purchase the pass online for one, two, three or five days. Also known as the Vieux Carré (Old Square), the French Quarter covers a grid of 98 magnificent square blocks. Dating from 1718, it is one of the oldest districts in the country, with superb 18th- and 19th-century architecture. The handsome buildings erected after this time, with their arches, fanlights and filigreed wrought-iron balconies, are actually Spanish in character. 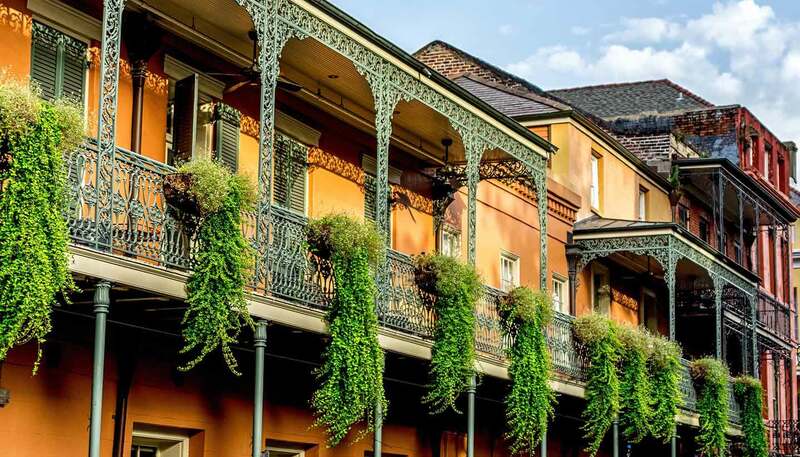 The focal point of the French Quarter is Jackson Square, arguably the loveliest square in the USA, and Bourbon Street, the neon-tinged tourist hub lined with daiquiri bars and strip joints. Completed in 1835, the Old US Mint manufactured Confederate money during the Civil War and continued to mint US coins until 1909. Its thick walls also served as a prison when Union troops captured the city. Today it houses the excellent New Orleans Jazz Collection, which features music, artefacts and instruments, such as Louis Armstrong's first cornet. Telephone: +1 504 568 6993. The simple yet elegant facade of St Louis Cathedral is a focal point of Jackson Square. Named after the former King of France, this is the oldest cathedral in the United States. It is the third church built on this site: a hurricane destroyed the first in 1722 and a fire the second in 1788. Dedicated as a cathedral in 1794, the present building was extensively remodelled between 1849-51. Pope Paul VI designated it a minor basilica during his visit in 1964. Telephone: +1 504 525 9585. Daily 0830-1600, mass at 1205. Designed in 1791 as a rectory for the priests of St Louis Cathedral, the Presbytère was finally completed in 1813. By then, New Orleans had become part of the United States and the church rented the building to the city for use as a courthouse. It was sold to the city in 1853. Today, it houses a dazzling collection of Mardi Gras memorabilia, from masks and costumes to videos and interactive displays about the history of the event. Telephone: +1 504 568 6968. This excellent museum displays exhibits from the museum's large art collection and hosts major travelling exhibitions. Highlights of the permanent collection are on the upper two floors and include the pre-Columbian collection, Native American art, the Asian wing, American and European paintings, and one of the largest glass collections in the country. There is also an attractive sculpture garden. Telephone: +1 504 658 4100. Tues-Thurs 1000-1800, Fri 1000-2100, Sat 1000-1700, Sun 1100-1700. New Orleans is famous for its Cities of the Dead (cemeteries) because the high water table made underground burial difficult, so people built ornate marble tombs and vaults above ground instead. Decorated with statuary, mosaics and other ornamentation, St Louis Cemetery No 1 dates back to 1789 and is the oldest of the city's many such burial grounds. It is also one of the most atmospheric, with crumbling tombs and the graves of some of the city's historic personages, including the voodoo queen Marie Laveau. Telephone: +1 504 596 3050. Built between 1795 and 1799, this handsome building takes its name from the Spanish council, or cabildo, which met here in colonial times. It is a fine example of the Spanish colonial style with its wrought-iron balcony railing arguably the most outstanding work from that period in the city. In 1803, in a room called the Sala Capitular on the second floor, France signed the Louisiana Purchase, which ceded a huge territory west of the Mississippi, including New Orleans, to the United States. Today, it houses a museum of Louisiana history, and exhibits include the colony's founding stone and Napoleon Bonaparte's death mask. Built in 1831 for a wealthy merchant named Samuel Hermann this Federal-style house is among the best examples of American architecture in the Vieux Carré. The highlight is the Creole kitchen, where cooking demonstrations take place over the open hearth, all day on Thursdays from October to May. There are also period rooms and a restored stable. Telephone: +1 504 525 5661. Tours Mon-Tues & Thurs-Fri at 1000, 1100, 1200, 1300 and 1400, Sat 1200, 1300, 1400 and 1500. Celebrating the accomplishments of the Americans who participated in WWII, the museum gives a fascinating political and economic overview of the build-up and mobilisation of the Allied Forces' 17 different amphibious invasions during D-Day. Crammed with maps, filmed narrations, artefacts and photographs, it puts a face on the war. Telephone: +1 504 528 1944.